SCENARIO: we’ve all just watched Duke demolish Virginia 84-56 to win it all, in a meeting of the top two overall seeds in the tournament. It’s only the 3rd time all year that Virginia allows more than 70 points. If this seems like a little bit of a boring outcome, I promise, a 16-seed beats a 1 in this one. But we’ll get there. 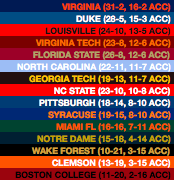 First, the ACC. It’s Virginia that comes out on top in the ACC regular season race, including a sweep of the Duke Blue Devils. Their undefeated season lasts a while – after beating Duke for the second time, they’re 22-0 and have been the only unbeaten team left in college basketball for about three weeks. But that streak doesn’t make it to 23-0, as the Hoos fall rather handily in Chapel Hill against UNC in the next game. Still, they lose only once more (@Louisville two weeks later) and win the ACC tournament as the top seed. At 31-2, they’re ranked #1 going into the NCAAs and get the top overall seed as a result. Duke, for their part, goes 15-3 in ACC play, only losing twice to Virginia and in the last game of the regular season against Carolina. We don’t get another Duke/UVA matchup in the ACC tournament, though, as Louisville makes a run to the final, topping Duke in the process. The big surprise of ACC play is probably Georgia Tech, who run up an 11-7 conference record but fall short of making the tournament. Still, the Yellow Jackets put up some impressive wins @Virginia Tech, @NC State and vs. Florida State. Next, the SEC, which sees Kentucky make a (sorta) surprising run to the Final Four. Kentucky has been a very volatile team in these sims. Last time out, they came 12th in the SEC, but won five days in a row to pull out a conference tournament win. This time, it’s a much more conventional season, although Kentucky is not particularly highly touted. They finished 4th in the SEC, enough to nab them a #6 seed in the NCAAs, which we’ll see ended up working out just fine for them. 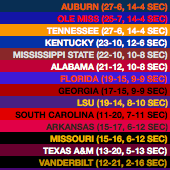 In the SEC, they’re behind a three-way tie for the top between Auburn, Tennessee, and a surprising Ole Miss. Though they’re all 14-4, it’s Auburn who winds up with the best outcomes out of the three. After taking a beating from Tennessee to end the regular season, the Tigers get sweet revenge in the conference tourney championship game, beating the Vols by 10. After Kansas failed to win the Big XII tournament crown, that win was just enough to see 27-6 Auburn edge them for the final #1 seed. Tennessee, with the same overall record, is down at a #3 seed as the shine came off of them slightly with a few really poor results, including losing to LSU by 40! The final Final Four team is, a bit surprisingly, TCU! So, the Big XII is next. Kansas’ streak of Big XII titles continues in this sim, as a wide-open conference breaks their way. It looked as though their hopes would be sunk with a loss to Oklahoma in the second-last game of the schedule, putting them 1 game behind Texas Tech, but the Red Raiders fell in their final matchup against Iowa State, while Kansas edged out Baylor, preserving the streak. Kansas gets the #1 seed. One of the teams they most have to thank for that is TCU, who come 3rd! Though they lost twice to Kansas, they swept TTU, holding them to 48 points in the home game. They also won both games against Iowa State and finished 11-7 overall. Though they went out against Baylor in their first conference tournament game, a 23-9 TCU team gets a #5 seed. Kansas, as mentioned above, is a #2 seed, and TTU is a #4. The Big Ten is won by 16-4 Michigan State, clinched in the second-last game of the season in a blowout win over second-place Nebraska. 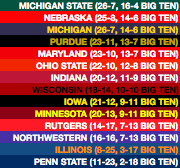 As usual, the top half of the Big Ten is really competitive, with two teams at 14-6, two more at 13-7, and teams at 12-8 and 11-9 as well. I’d put some money down on the Big Ten being the conference that ultimately gets the most teams into the tournament – I’ve seen as many as ten in simulations, and it’s hard to envision there being fewer than eight. It’s eight here – Wisconsin misses out with 14 losses, but a 21-12 Iowa does get in despite a sub-.500 conference record. The Big East is won by Marquette, who own sweeps against 7 of their 9 Big East opponents. The only ones who are able to beat them (in the regular season) are St. John’s, who already own a real-life victory over the Golden Eagles and swept them here, and a surprising DePaul, who finish 9-9 in conference play and finish in the top half of the conference for only the second time since joining the Big East, and first time since 2006! It has been a tough year for the Pac-12; the best-case scenario for that league is to see 3 or 4 teams pull far away from the pack, enough to see most or all of those teams get in. Here, 4 teams pull away from the pack, and 3 of them get in. The quartet of Washington, Oregon, Arizona and UCLA finish a combined 56-16, 47-7 against the other eight Pac-12 teams. All between 15-3 and 13-5, there’s another 4 games of space before the next group of Pac-12 teams comes in at 9-9. The American largely goes the way it’s expected to go, with one exception: a surprising Memphis, led by rookie coach Penny Hardaway, finishes 14-4. That’s one game behind the champions Houston, and it’s good enough to make the Tigers the last team given an at-large bid to the NCAA tournament. If you’re counting, you know that there are two at-large bids that have yet to be accounted for, and we’ll do that here. San Francisco is headed to Dayton for the First Four after going 13-3 in WCC play and making a run to the conference tournament final. 26-6 overall will just barely get it done, although they’re devoid of too many marquee wins, having lost 3 times to Gonzaga. The other at-large bid goes to Buffalo after a textbook case of bid thievery. Buffalo was getting in regardless, though losing in the MAC semifinals to Northern Illinois bumps them down quite a bit to the 7-seed line. The MAC auto-bid goes to Ball State instead. Check out the #1 pod in the Midwest Region, taking place in Jacksonville, FL. It’s not just another 16-over-1 upset, it’s another absolute beatdown: Green Bay 88, Auburn 61. A peek under the curtain – these games are simulated in part by generating a random number between 0 and 9999, with lower numbers favoring the team listed first and higher numbers favoring the other team. So, for example, a value of 9000 would represent the 90th percentile of outcomes for team B, in this case Green Bay. In this game, Green Bay wins if the drawn number is 9713 or higher – in other words, BracketBot estimates they would have a 2.87% chance of beating Auburn. The number that came up in this game is 9999, resulting in a 27-point beatdown. While it’d be possible for UWGB to win by more, that would be at least a one-in-ten-thousand occurrence. Hope you enjoyed this season sim! Let me know if there are any features you’d like to see me add!